B&W ASW610XP review | What Hi-Fi? B&W's ASW610XP is designed to offer the best of both worlds. A sibling of the company's acclaimed £400 design, the ASW610, the 'XP is small – just 32cm tall – but thanks to its ultra-stiff, long-throw 25cm drive unit and formidable 500w Class D power amp, it sounds genuinely massive. As with all recent B&W subs, the 'XP is a sealed-box enclosure, its complex Kevlar/paper drive unit ensuring minimal deformation under even the most extreme duress: push the B&W very, very hard, and it'll maintain a stringent accuracy that few rivals can equal. 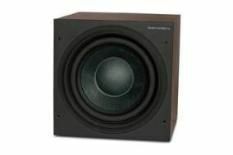 However, there are limits to what a conventional wooden subwoofer cabinet can achieve, even one as stiff as this. For all the brilliance of the drive unit and power amplification, we occasionally drew a murmur of protest from the ASW610XP's cabinet as it struggled to contain the massive physical forces thundering through its innards. Its sibling design, the B&W PV1, remains a cleaner, less coloured listen in this regard – but bear in mind, we are talking about comparisons with a notably more expensive sub, and also about listening conducted in a big listening room at volumes that your neighbours would find distinctly unfriendly. Rein the volume in only a little, and you'll find the ASW610XP has all the real-world weight and authority most living rooms and listeners could ever wish for. It's agile and expressive, too: the sound fairly teems with energy, blending cohesion and formidable extension in equal measure. You might question the price – £300 seems quite a premium over the essentially similar '610 – but otherwise, there's nothing to find fault with here.